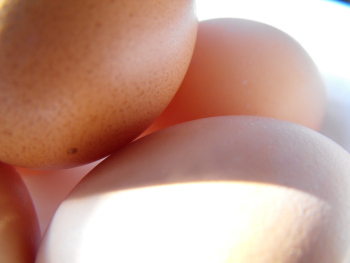 Eggs used to be called "nature's most perfect food." Today, eggs are out of balance, like most of our diets, containing little omega 3 fatty acids and an overabundance of omega 6 ones, for the simple reason that chickens' main food now is corn. There are many ways to correct this imbalance, such as substituting worms for corn. But free ranging them or pasturing them is not enough. Studies have found that the omega 3 can be brought back in balance most simply by adding 5% (five percent) flaxseed to their food ration. I've experimented with different ways of doing this other than paying double for special formula chicken feed. Flax seeds sprout in about a week, so sprouts are one way. My chickens love a tray of ground flax seed and gobble it up in no time, but they waste a lot picking and flinging it. What works best for me is to grind the seed (30 seconds in a food or coffee mill), add enough water to make a paste, and feed it in a flat pan. It is gone in a couple of minutes with no waste. Editor's Note from Anna: My hens each eat three quarters of a cup of laying pellets per day, so using Daddy's math I should be giving each one about two teaspoons of flaxseed mash per day. Dosages for your hens may vary slightly, but are probably in the same ballpark. For those of you with a lot of chickens, there are 48 teaspoons in a cup. The Purslane weed overtakes my yard every summer. I know that the leaves have a high Omega-3 content. It seems it would be a cheap (free) way to supplement their diet throughout the summer months as an alternative to flax seed. It is also a way to supplement Omega-3 for people. The leaves can be put in cucumber salads, eaten whole as a vegetable, or possibly cooked. It's a succulent plant though so tends to be on the slimy side. They don't taste bad though. Free, and no effort to grow seems like a winner. I suspect that if your chickens have constant access to high quality pasture, you don't need to supplement their omega 3s in any way, except possibly in winter. I use the color of the yolks as a gauge --- if they're bright orange, all's well. But if you do need to supplement, I love the idea of feeding a weed!